FIGURE CAPTION: More than 20,000 space debris fragments are now orbiting the Earth and presenting serious collision hazards to their companions in space. In 1978 a NASA researcher, Donald Kessler, concluded that, if too many large objects were placed in low altitude orbits around the Earth, successive collisions between them could create a "chain reaction" that would, in turn, create so many additional objects, safe space launches could become impossible for future generations. much too dangerous for anyone to advocate. hurl them back to Earth into remote oceans areas for safe disposal. at the Kirtland Air Force Base in Albuquerque, New Mexico. Russian and American booster rocket design. and autographed copies of two of Logsdon’s published books. A few slots are still available in those two classes. Register early to assure your acceptance. CleanSpace One- The World’s First Space Janitor To Clean Up Space Debris! What distinguishes the Swiss? Ingenuity and tidiness! The researches from Swiss Federal Institute for Technology announced yesterday that they will be designing the world’s first janitor satellite. The project is called CleanSpace One and will be launched within 3-5 years. Space debris is a really big issue. The U.S. space agency NASA says over 500,000 pieces of spent rocket stages, broken satellites and other debris are orbiting Earth. The debris travels at speeds approaching 17,500 miles per hour (28,000 kilometers per hour), fast enough to destroy or inflict expensive and time-draining damage on a satellite or spacecraft. Collisions, in turn, generate more fragments floating in space. Space junk has collided with satellites at least twice: In 1996, a French satellite was damaged by a rocket fragment, and in 2009, a satellite owned by U.S.-based Iridium Communications was destroyed in a collision with a derelict Russian satellite. “It has become essential to be aware of the existence of this debris and the risks that are run by its proliferation,” said Claude Nicollier, an astronaut and EPFL professor. Building the satellite means developing new technology to address three big problems, scientists say. The first hurdle has to do with trajectory: The satellite has to be able to adjust its path to match that of its target. EPFL said its labs are looking into a new ultra-compact motor that can do this. Next, the satellite has to be able to grab hold of and stabilize the debris at high speeds. Scientists are studying how plants and animals grip things as a model for what would be used. And, finally, CleanSpace One then has to be able to guide the debris, or unwanted satellites, back into Earth’s atmosphere, where both the Swiss-made satellite and the floating garbage it collects would burn on re-entry. It remains to be seen how cost-effective the satellites are since each one would be destroyed after its mission, but governments might provide some funding if governments agree to rules to limit debris. In 2007, China purposely destroyed one of its own satellites with a missile in a test, putting an estimated 150,000 smaller pieces of debris into space and 3,000 big enough to be tracked by radar on the ground. More recently, Russia’s $170 million planned Mars moon probe got stranded in Earth’s orbit after its Nov. 9 launch. Efforts by Russian and European Space Agency experts to bring it back to life failed. It was one of the heaviest and most toxic pieces of space junk ever to crash to Earth. There have been no reports of anyone ever being hit by it on Earth, but the problem it poses has slowly gained traction in political circles in the decades since the space age began more than a half-century ago. The European Union has proposed its own draft rules for operating in space and the United States views that document as a starting point. U.S. Secretary of State Hillary Rodham Clinton warned last month of the space environment is threatened by space junk, and said the U.S. will hold talks with the EU to set informal rules aimed at limiting debris. What is your opinion? Please comment below. NASA Is Looking For New Ideas For Space Travel! 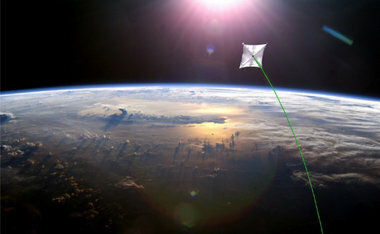 A NASA artist's rendering of a solar sail in space. The technology could have many uses in future exploration, the space agency says. Got an idea? Here is your chance to present it as well as win a competition. What are some of the ideas on the table? Here are just a few. This is all very exciting except for one thing. All this ideas are being gathered in order to assist NASA’s new heavy-lift rocket that is supposed to be launched in 2017. There is a lot of debate on whether or not the proposed launch will ever happen. There is also concern that the huge budget of the project will pull the funds away from new and emerging technologies.